Orissa has continued its growth momentum as a favourite destination for investors attracting investments worth Rs 98,929.49 crore in the April-June period of this fiscal. The most of these new investment proposals are in sectors like power, steel, cement, food processing and downstream industries. The single largest investment proposal of Rs 45,000 crore has come from Strategic Energy Technology Systems Pvt Ltd for a coal to liquid project at Angul on May 12, 2010. The bulk of the investments- Rs 33,569.25 crore has been proposed in the power sector with proposals for setting up of Independent Power Plants (IPPs) with a cumulative capacity of 7740 MW. Ferro Alloys Corporation (FACOR) Power Limited has proposed to set up a 270 MW (2×135) coal-based thermal power plant at Haridaspur in Jajpur district. Similarly, KU Projects intends to set up a 1320 MW (2×660) power plant a Thakurpur in Sonepur district at an investment of Rs 7260 crore. This project has been cleared by the High Level Clearance Authority (HLCA) of the state government. Similarly, Shivani Thermal Power Station of Ghaziabad (Uttar Pradesh) has proposed to set up a 1320 MW (2×660) power plant at Chhotapadagan in Cuttack district at a cost of Rs 7554.54 crore. Visa Power has submitted a revised proposal to the state government owned Industrial Promotion and Investment Corporation of Orissa Ltd (Ipicol) to set up a 1320 MW (2×660) power plant at Brahmanabasta in Cuttack district, entailing an investment of Rs 6319.48 crore. Shri Anant Infra Energy Pvt Limited has evinced interest to set up a 210 MW coal-based power plant at Garjan Bahal in Sundergarh district. Responsive Industries Ltd has proposed to set up a 1320 MW (2×660) power plant at Manmunda in Boud district at a cost of Rs 6487.50 crore. CLP Power India Pvt Ltd plans to set up a 1980 (3×660) MW power plant at Majhapada in Sundergarh district at a cost of Rs 10,000 crore. Among the investment proposals in the cement sector, Kolkata-based Icore Super cement Ltd has proposed to set up a cement plant at Somnathpur in Balasore district at an investment of Rs 151 crore. While Ramco Industries Limited has evinced interest to set up a 120,000 tonnes per annum asbestos fibre cement sheet plant at Jharsuguda at a cost of Rs 35 crore, Madras Cement intends to set up a 4000 tonne per day cement plant at Nandibera in Malkangiri district at a cost of Rs 750 crore. Reliance Cementation Ltd has submitted proposal for a 2.8 million tonne per annum cement plant at Jallangbara in Sundergarh district at a cost of Rs 970 crore. Similarly, Binani Cement plans to set up a one million tonne per annum clinker grinding unit at Dhamara in Bhadrak district at a cost of Rs 130 crore. In the steel sector, Rashmi Metalliks Limited has proposed to set up a three million tonne per annum pelletisation plant and 44 m captive power plant at Baliarpur in Bhadrak district at an investment of Rs 3465 crore. The Orissa Minerals Development Company Limited has evinced interest for a two million tonne per annum beneficiation and pelletisation plant at Dalki in Keonjhar district at a cost of Rs 889 . Balangir, Sept. 20: Fighting against all odds, two young boys made Balangir proud by winning titles in the state open badminton championship in Talcher on Sunday. Abhimanyu Bagarty (12), son of a rickshawpuller in Balangir, won the singles title in the boys’ mini (under-13) category while Surendra Nepal (14), son of a daily labourer won the men’s singles title in the sub-junior category. Surendra also won the men’s doubles title with Chandan Mishra in the sub-junior category, while Abhimanyu teamed with Swarup Ranjan Guru to emerge as runners up in the boy’s mini double category. 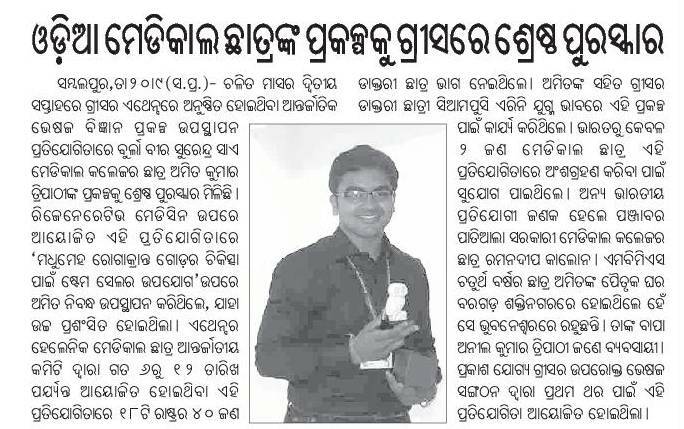 Two others — Bikrant Jani who emerged as the runner up in the boy’s mini singles category and Arabinda Sahu, who was adjudged the best emerging player of the tournament — also hailed from Balangir. Abhimanyu said that he used to play badminton in the streets when Susanta Pradhan of the District Badminton Association (DBA) picked him up after noticing his talent. “I was very young when I developed a passion for games. I used to play badminton with my friends in the streets of our locality. We used bundle of polythene carrybags as shuttle and a flat piece of wood as racket. Susanta dada used to watch me. One day he took me to the DBA office and formally admitted me there,” he said. Abhimanyu’s father, a rickshawpuller in the town, said that he was exulted at his son’s achievements. “I knew that he was fond of sports. Since I am a poor ricksha puller, it was not possible for me to meet his requirements. But, I also never knew that my son possessed such talent. I hope that he will do even better in the years to come,” he said. The success story of Surendra Nepal is similar. Son of a daily labourer in an aluminium factory, he never thought that he would play in any state-level tournament. He was picked up by Rajiv Sahu of the DBA who noticed him playing badminton in the streets of the town. “I never thought that I would play in such a tournament and win title. It is like a dream come true for me,” he said. “There are many kids in our association who are from very poor families. We try to help them by providing them with playing equipment, tracksuits and shoes. We are very happy that our efforts have paid well as two boys who came from such poor backgrounds have won titles. This is the beginning. We will ensure that they go on to win tournaments at higher levels,” said Suru Matari, secretary of the DBA. Chief Minister Naveen Patnaik on Saturday directed the concerned officials to expedite the construction work of lower Suktel dam project which would provide irrigation facilities to 31, 830 hectares land of Balangir and Sonepur district. The Government would make expenditure lay out of Rs 1,041.81 crore for the project. Reviewing a meeting on the progress of the said project at the State Secretariat, Patnaik issued this direction. It was known from the meeting that the project has already got state II forest clearances and land acquisition work has been going on in full swing. It was decided in the meeting that two officers would be appointed to see that land acquisition work for main reservoir and dam should be completed by October end. The project which would spread over 1230 square kilometre will have a 1410 meter-long earthen embankment (dam). Of the targeted lands to be irrigated by the project, while 29,850 hectares land belongs to Balangir district, 1, 980 hectares land of Sonepur district would be irrigated. Among others, Planning and Coordination Minister AU Singh Deo, Chief Secretary Bijay Patnaik, Principal Secretary to CM Aditya Padhi, Water Resources Secretary Suresh Mohapatra, Revenue Secretary RK Sharma and Central RDC PK Mohapatra were present at the meeting. The Vir Surendra Sai University of Technology (VSSUT) formed by up-gradation of the University College of Engineering (UCE) at Burla completed a year this month with Prof Deba Kumar Tripathy as the first Vice-Chancellor. “It (VSSUT) has made record achievements during this short span. It also plans to go ahead and reach the peak to see itself at par with all other developed technical institutions of the country and abroad,” said Prof Tripathy at a media conference in the university campus. The V-C said the university, being entrusted by the Department of Industries, conducted the Joint Entrance Examination (JEE) 2010 this year very successfully for students’ admission into medical, engineering and many other technical courses through e-counselling. Formation of a finance committee and a board of management, filling up of the vacancies in teaching posts and appointment of deans, Registrar and Controller of Finance are the other achievements, he said. The university also held its first convocation for the pass-out batch of students for the year 2009. “Smooth conduct of different examinations and publication of results in one month’s time is nothing but a record in the State,” Prof Tripathy claimed. As many as 305 students have been recruited in various reputed institutions and industries during 2009-10 through campus interviews, he pointed out. The V-C further said the university has introduced new programmes like Electrical and Electronics Engineering, MTech in Computational Math and MSc in Applied Physics and Industrial Chemistry. It has also enhanced the intake capacity to various programmes keeping in view the growing demands from students. Prof Tripathy informed that the State Government has sought a proposal from the VSSUT for converting it into an Innovative University. The Centre Government wants to convert 20 technical institutions in the country into such universities. The VSSUT can stake its claim for this as it fulfils most of the criteria. 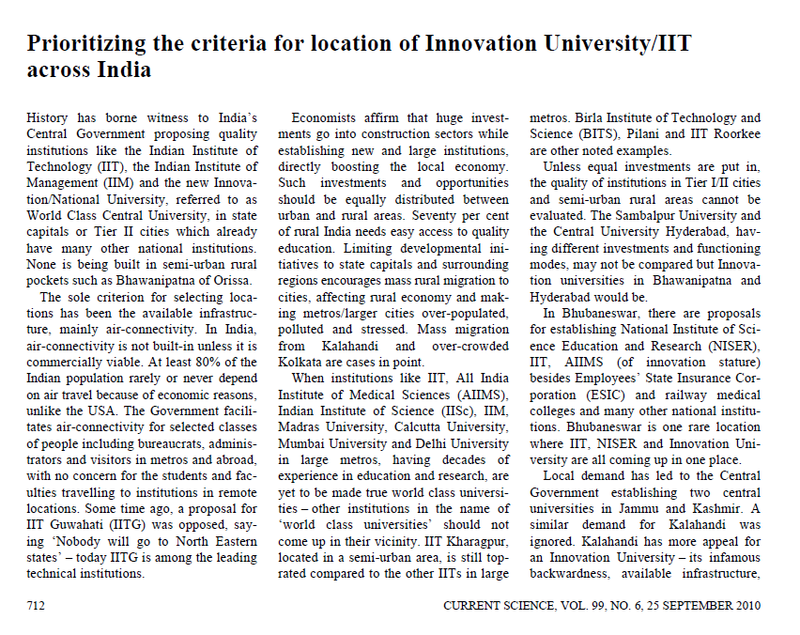 “The Centre Government will spend `4,600 crore to upgrade 20 institutions to Innovative Universities,” the V-C further informed. Instead of establishing new universities, the Government will rather improve the old ones, he added.